Congratulations to my friend, Kennedy Ryan, on her new release. 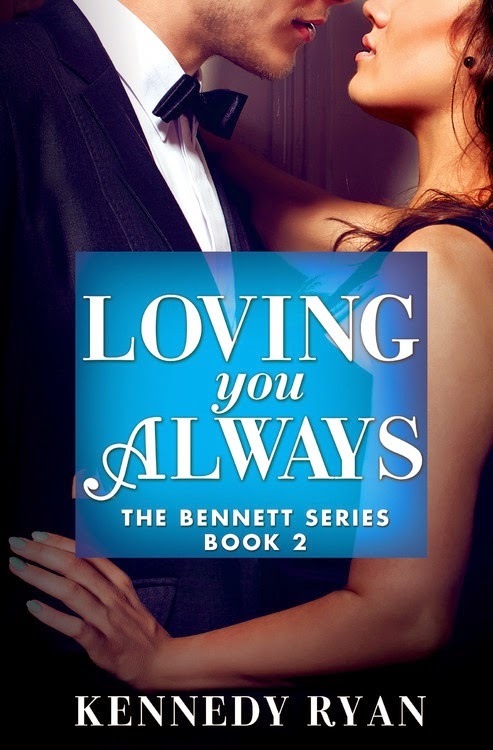 Loving You Always is available for purchase now. Moving like an old woman, she shuffled into her bedroom and lay on the bed. She didn’t bother removing the kimono, but just slipped under the covers and went to sleep. Walsh looked away from Shelby’s probing stare and directly into Kerris’s eyes. He smiled that slow smile she’d never seen him give to anyone else, reaching out to tangle his long fingers with hers. He pulled Kerris to him, towering over her, sheltering her. She had missed this feeling. In these few moments, she forgot about Shelby. Forgot about the world outside of these arms. There was only now. There was only them, and things were right. She wasn’t sure how it had happened, but things were finally right. Walsh whispered her name like an incantation. “Walsh,” she muttered, still clawing her way out of the dream. She sat up in bed, rubbing her eyes and pulling the kimono close around her neck. “What’d you just call me?” Cam stood in the semidark, the lamp illuminating the mounting rage on his face. “Cam! Oh, gosh. No. No, it’s not…not—” she sputtered, still blinking heavy sleep from her eyes. His hot, alcohol-soaked breath fanned her face. She realized his words were not crisp, but slurred, slopping around in his mouth, crowded out by anger and outrage. Cam pushed her hand away.